I used Country Girl for my image. I love ladybugs, and thought this was perfect for a polka dot theme. I used Twitterpated paper for the background. The base of the card is a black circle with two pieces of Real Red cardstock cut out to make wings. I covered the wings with black dots. 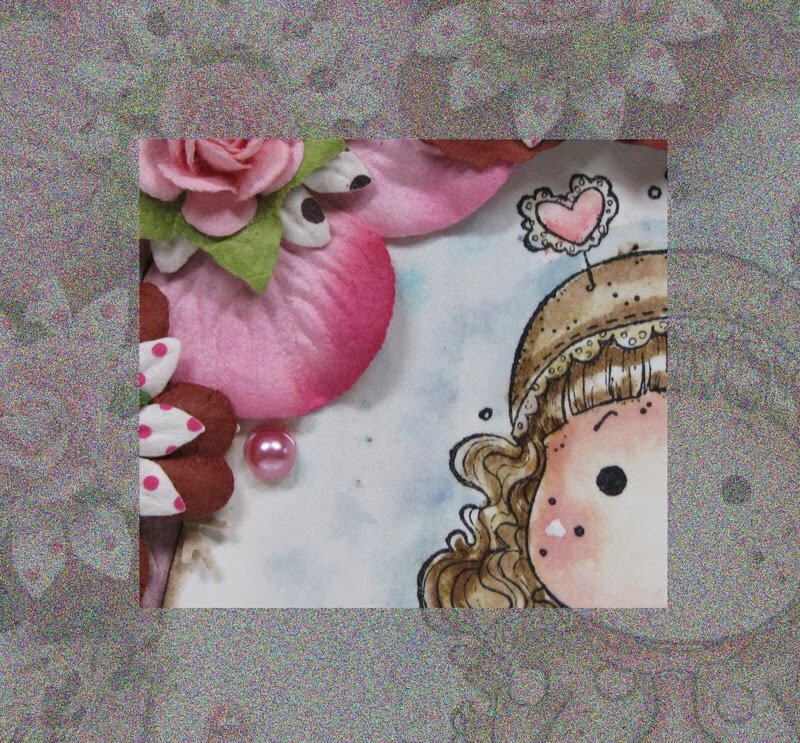 I used some ribbon and buttons to embellish the card. I colored Country Girl with Copics. I combined some other challenges into this one. I joined the Basic Grey Challenge, which is "Fabric." I used some Mod Podge on fabric and added the fabric as part of the background, and also cut out fabric and pieced it onto her dress. I surrounded her dress with Stickles. The other fabric piece is behind the braided organza and bows. I also incorporated the Midnight Madness Sketch Challenge #68. Thanks for coming by today! See ya soon. I was asked to make a card by a friend from church. She wanted a garden theme with the colors purple, green and pink. I immediately thought of my Hanglar images I had stashed away for a special occasion. As you probably know, we can't get these stamps in the U.S., so I am hoarding images and afraid to use them because I might run out. How silly is that? 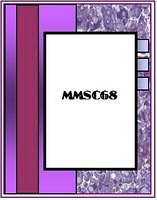 The designer paper is from Paper Pizazz.I must admit, purple and green is my favorite combo. 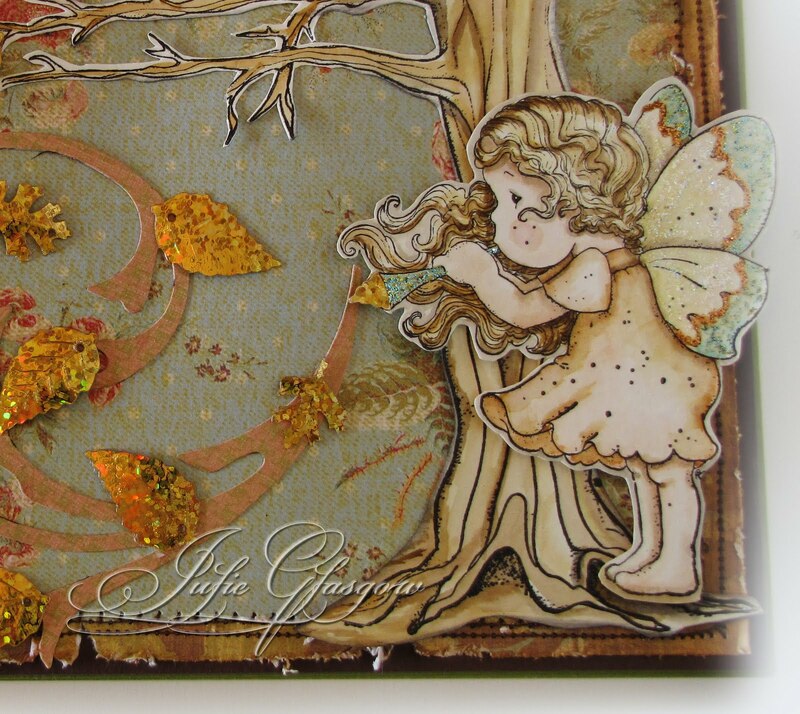 This sweet little Hanglar image was part of a set of images sent to me by a lovely blogger. I wish I could say I own some of these darlings, but alas, no. I colored her with Copics. This beautiful pink flower started out white. I used my Copics Airbrush System to add the pink color. Thank you so much for stopping by today. 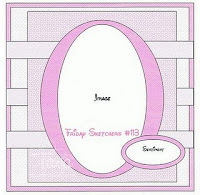 I hope you will join the challenge at Cute Card Thursday. The newest challenge at 7 Kids College Fund Challenge Blog is "Strip it Down!" Okay, that does not mean crafting in your undies, unless you feel so inclined (hee hee). The challenge is to have no more than 2 layers (not including your image). 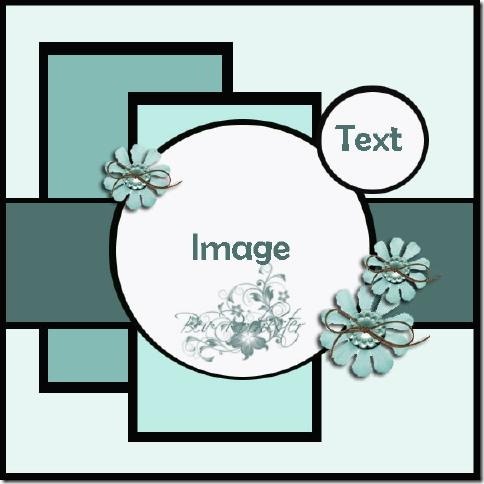 Part of my inspiration for this card came from another challenge, which was called Summertime Blues. However, I realized I would be too late to enter the challenge. I still liked the theme, so took off with it anyway. I also used the sketch from yet another challenge with cut off time prior to this posting. Oh well. .
My sentiment was stamped and punched with a circle punch, backed with a blue scallop circle, and mounted on the designer paper which happened to include circles with little greed dots that ended up looking like another scallop. My background is one layer of designer paper, 2 sheets cut down to create one layer. The trim is actually a little right of the line between papers (does that make sense?). Thank you so much for stopping by today. I hope you will join out challenge this week! 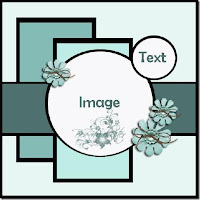 The image is called Freebie 600 and you can get this darling image by Joining Sassy Cheryl's group on Paper Craft Planet. I colored her with Copics. The papers are K&Co and Die Cuts With a View. Thank you for stopping by today. Your comments are always appreciated. 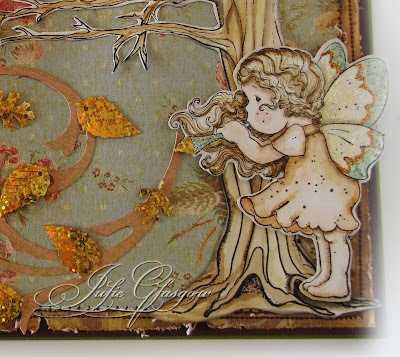 The Cute Card Thursday Challenge this week was to make a card using trees and/or leaves. I made a fairy-themed card using Bubbling Tilda. I found these gold prismatic leaves at a little gas station/store in Leadville, Colorado. They were in the dollar bin. I knew I could find a use for them. I came up with the idea of a card with a fall fairy blowing the leaves off the tree. If you look at her horn, you can actually see a part of a leaf at the end of it instead of a bubble. I wanted to give the feel that she is actually blowing the leaves from the horn. It is hard to see the shine (due to questionable lighting), but I added Stickles to her wings. I am so glad you stopped by today. 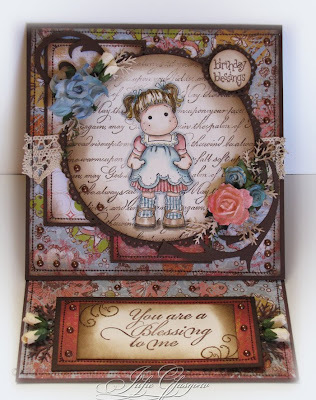 I hope you will join the challenge at Cute Card Thursday. UPDATE: I am so thrilled. 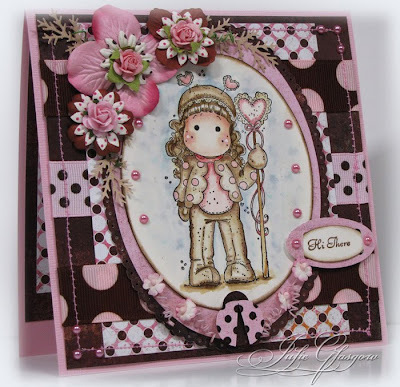 I won the Magnolia Down Under Challenge with this card! Thanks to the designers at Magnolia Down Under for this honor! I colored Tilda with distress inks, masked the image and stamped over it with my Script Background Stamp (SU!). I used Urban paper (K&Co). I stamped "You are a Blessing to me" (Stampabilities) and Flourishes v.2 (Autumn Leaves) for the base of my easel, and finished off my embellishments with flat back pearls. Thanks for stopping by today. I so appreciate your wonderful comments. You are such a blessing to me! 31 comments that make blogging fun! The sentiment is from Circle of Friendship from SU! (retired). I made a birthday card to enter into the Magnolia Down Under Challenge - Birthdays. Thank you for coming by to visit today. See ya soon! Have you heard the news. There is a new challenge blog in town. The designers at 7 Kids College Fund have started a challenge blog to help inspire you and get those creative juices flowing. The prize for our first challenge will be a $50.00 Gift Certificate to the store!! Ink: Staz-On, Distress Ink, Chocolate Chip. I used the sketch from Friday Sketcher #113 as the base design for my card. Here is a closeup of my image, colored with distress inks. I had some Prima flowers with polka dots that I added to my bouquet. I used a 1/2 inch and 3/4 inch punch to create the pink and brown ladybug. I used my Chocolate Chip marker to color the dots. Won't you come join us at 7 Kids Challenge Blog! I look forward to seeing your creations! Come on by Wednesday to see the whole card...and join us for the first 7 Kids Challenge.